The ancient Holy Temple in Jerusalem was by all accounts a marvel in its times. What was the Temple all about? What were its functions and what did it actually look like? Where are its precious artifacts today? 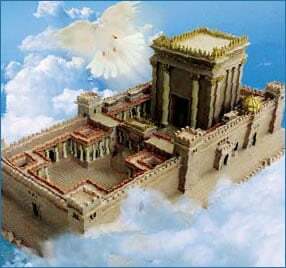 And most of all, why does the Temple continue to hold such a central place in Jewish prayer and thought? This Torah learning is dedicated to the honor, merit, safetey and success of the heroic soldiers of the IDF and the people of Israel! The first nine days of the month of Av (Monday, July 28 through Tuesday, August 5) are days of acute mourning for the destruction of the first and second Holy Temples. Among other observances, during this time we refrain from eating meat or drinking wine (except on Shabbat), swimming or bathing for pleasure, remodeling or expanding a home and buying new clothes. The Fast of Tisha B'Av begins on Monday, August 4th at 8:11 pm and concludes the next day at 8:36 pm (times local to the Clear Lake area). As these lines are being written, our Twitter feeds, Facebook accounts, e-mail inboxes, evening headlines and phone lines carry ominous reports of troubled times ahead in Israel. Our extended Jewish family is under fire. Rockets are raining down on Israeli cities and towns, and war looms. And every Jew is asking him or herself: What can I do to help? Is there anything we can do? Most of us are hundreds or thousands of miles away, in our own communities. Yet our very being cries out: What can we do? The Lubavitcher Rebbe, Rabbi Menachem M. Schneerson, of righteous memory, taught us that yes, there is something we can do. The Rebbe taught us the power of a mitzvah. The bodies of three Israeli teenagers who were kidnapped in the West Bank earlier this month were discovered Monday by Israeli forces north of the city of Hebron. The three students went missing 18 days ago on their way home from their yeshivahs in the West Bank. When the three failed to arrive home or make contact with their families, authorities were notified. Naftali Frenkel is also an American citizen. The boys’ parents—Ophir and Bat Galim Shaar, Uri and Iris Yifrach, and Avi and Rachel Frenkel—were told of the tragic news soon after the bodies were found by a search team that included IDF soldiers from an elite unit. It was apparent, authorities said, that the teens were killed soon after their abduction and were partially buried in an open field in an area that was difficult to access.